A loud distorted guitar opens the first rockin’ tune, “Fake Love.” With Mason Jones’ vocals and the rest of the boys — Dawson Tucker playing guitar and bass, Derrick Stephen on drums and percussion, and Dominic Valenti playing guitar — we get sucked in quick and hard to Atlanta alt. 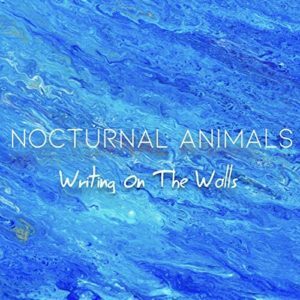 rock group, Nocturnal Animals’ Writing On The Walls. The distinctive riff of “Margot” makes for a naughty rocking great tune. I like how the guys keep this one right where it starts, a real sly grooving number locked and loaded. Tucker adds some nice subtle moments with his bass especially and the lead is perfectly placed. The band even delivers hand claps at the end. It makes for a solid obvious single. Stephen begins “Fever Dream” then we get heavy slicing power chords running in for another solid pop/rockin tune, or what this band’s bio calls “Rock ‘n Roll soul to prick your senses.” Again, it’s as much the band’s in-the-pocket simple (yet not simplistic) playing with Jones’ slightly annoying (in a good way) vocal that makes these tunes such little gems. “The Haunting,” starting as an acoustic guitar ballad, ends this 6-song EP. Soon though the tune picks up into heavy guitar flickery and a jumpy drum beat. It’s another great one on this brew of smart, well-constructed tunes from a genre of music that usually is not my personal cup of tea. Yet, Nocturnal Animals’ Writing On The Walls works for me, very well indeed.